Call me a curmudgeon or stuck in the past, but it’s been a while since I’ve really liked any new release from Dogfish Head Brewery. The company makes an amazingly cellarable stout and some darn good year-round IPA offerings, but I just haven’t been able to agree with recent offerings. That is, until this tasty Czech style pilsner, Piercing Pils, came along. 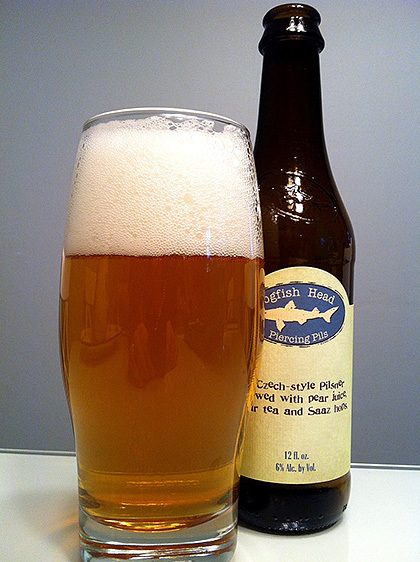 This 6% ABV pilsner incorporates white pear tea and pear juice into its recipe, post boil so that the fruit really comes out in the aroma and arrives at a decent level in the flavor. My only fear when first cracking it open and taking a whiff was that the beer was going to be overly fruity and sweet on the palate, but the level of pear influence is at just the right levels for my own personal liking, delivering a refreshing and unique take on the style. I’ve finally got a new brew from the company that I can thoroughly enjoy. Piercing Pils pours a light golden amber in color with a thick crown of white foam that left behind nice lacing as it dropped. Well, you certainly get a little bit of everything as described on the label: pear juice, tea leaves, bready malt, spicy hops, grain and grass. As stated in the intro, the fruitiness of this beer isn’t as forceful as I had feared. The pear juice is there, but sits comfortably as more of a complimentary role to the herbal tea notes, crackers, grain and a nice level of grassy, spicy hops. The beer has a light sweetness that fades gently in the lasting finish. The overall character of this beer is refreshing and lively. I’ll always be partial to Dogfish Head’s line of IPAs and their excellent World Wide Stout, but this tasty pilsner will certainly make another appearance in my fridge. Piercing Pils got just the right amount of pear and tea influence to go along with a solid pilsner backbone  the combination makes for just the right sort of beer after a long day’s work this Spring and Summer. 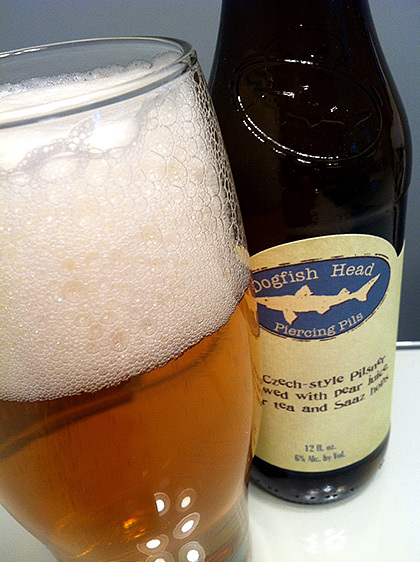 Share "Dogfish Head Piercing Pils"